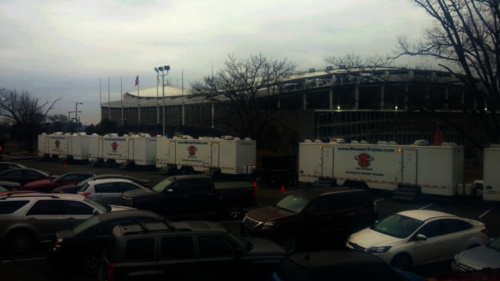 Superior Portables was proud to provide restroom trailers for the National Guard as they worked the January 2017 Presidential Inauguration. Given the magnitude of an inauguration, everything had to be perfect—even the restroom trailers. Our team worked with the National Guard to ensure enough units were provided. Our portable restroom professionals delivered and setup the trailers hassle-free so the National Guard could focus on more important event details. The restroom trailers arrived clean and stocked with supplies. And we made sure the trailers were removed the day after the inauguration. Our GSA certification makes us a preferred and trusted vendor for government projects. Our prices are pre-negotiated for federal buyers making the process as easy as possible. We're happy to provide restroom trailers to federal customers like the National Guard. When you serve our country, the least we can do is provide clean bathrooms to use. Contact us today to rent restroom trailers for your next government event.